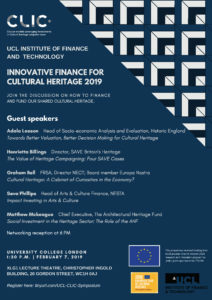 In the framework of the CLIC EU Horizon 2020 project, UCL Institute of Finance and Technology will host a symposium on innovative financial models and instruments to preserve and increase the value of both material and immaterial heritage assets, leveraging on their potential for increasing social cohesion and personal wellbeing, as well as on their pivotal role in building cultural identity and a sense of belonging across diverse communities. Professor Francesca Medda (Director, Institute of Finance and Technology, UCL) will open the works introducing the CLIC project, dedicated to develop, test and validate innovative circular business, financing and governance models to place cultural heritage and historical urban landscapes adaptive reuse at the forefront for the implementation of a European model of circular economy and circular city-region centered on the regeneration of cultural and natural capital. Leading industry practitioners will then provide the audience with insight and concrete examples of financial innovation in the cultural and creative sector. 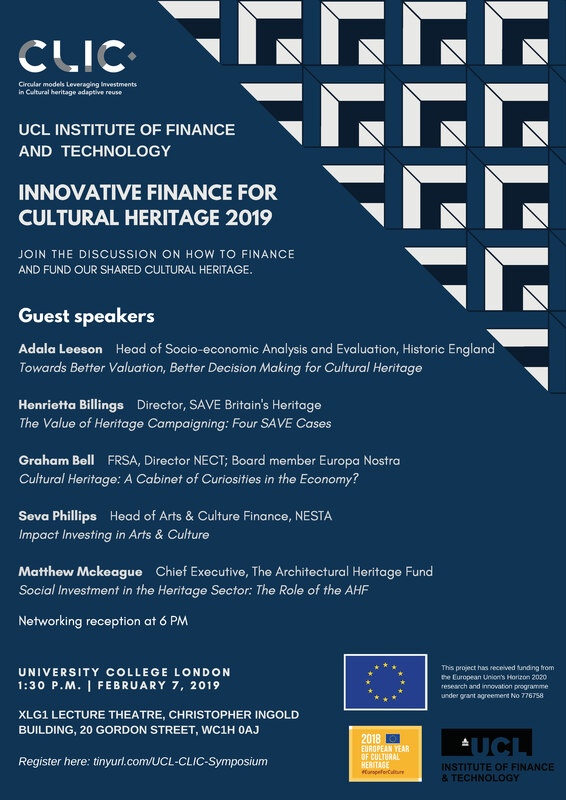 Speakers include Adala Leeson, Head of Social and Economic Research and Insight at Historic England; Graham Bell, Director, North of England Civic Trust; Henrietta Billings, Director, SAVE Britain’s Heritage; Matthew Mckeague, Chief Executive, The Architectural Heritage Fund and Seva Phillips, Head of Arts & Culture Finance, NESTA. The Symposium will be held on February 7th at UCL’s Christopher Ingold Building from 1:30pm and will be followed by a reception.